The Department of Physics and Astronomy offers major and minor programs in physics and a minor in astronomy. 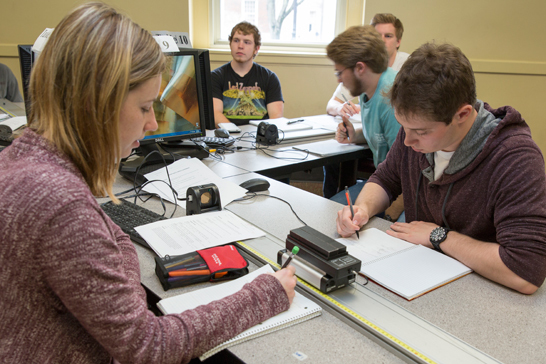 General information about UA’s physics programs are available on the University’s website. The department also offers a high school physics teacher certification program and a second-major curriculum for engineering majors. An Accelerated Masters Program for highly motivated undergrads is also available. General information can be found at the Graduate School website. Students use a computerized position sensor to demonstrate Newton’s laws of motion in their own experiment during a studio physics course. More information on the physics major and these tracks can be found on our Major Requirements page. We have a new program to recruit and train students who are interested in becoming certified high school physics teachers. For more information, visit our PhysTEC website. We also offer a second-major curriculum for engineering majors. For example, electrical and computer engineering majors need only 4 additional hours beyond their normal program to complete a second major in physics. This combination of fundamental and applied physics can be highly advantageous when the graduate enters the job market. More information is available at the bottom of our Major Requirements page. The University of Alabama offers an ‘Accelerated Masters Program’ for highly motivated undergrads. The program may lead to simultaneous completion of requirements for both master’s and bachelor’s degrees, each within its specified framework. Upon completion, students enter the job market with increased earnings potential. More information is available at the Graduate School website. The University of Alabama offers undergraduate students opportunities to participate in (a) cooperative exchange programs and (b) 1-2 semester national exchange program. Details on both programs can be found at the University’s Special Academic programs website.